for the past few years, i have been trading bikes a lot, and about 3 or so motorcycles ago, i had a really good time with a cbr250r. 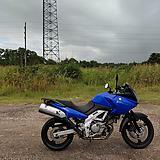 right now i have an 04 suzuki vstrom 650 that i have had for about a month, but hardly ride at all. i havent even bothered getting the title in my name. i have the title and the transfer paperwork, but i think i might leave it as is, in case i find someone wanting to trade with me. the vstrom is powered by a 650 v twin. the same engine that's in the sv650. i thought i'd be all about this bike, because i absolutely love the sv650, but it's just... ehh, idk. too big, too tall? i feel like i'm on a jet ski with wheels. it has plenty of power, and goes quickly and fast... i'm just not jiving with this bike, and i keep wanting another cbr 250 or 300. i'd actually prefer the naked version, the cb's if you live somewhere in the vicinity of the square(ish) formed by houston, austin, dallas, and san antonio, and you have a cb or cbr 250/300, and you have been wanting to get moar powah, hit me up. i might not be able to meet for a couple of weeks, but i'd like to talk.